Occasionally Blogging, but always staying fit. 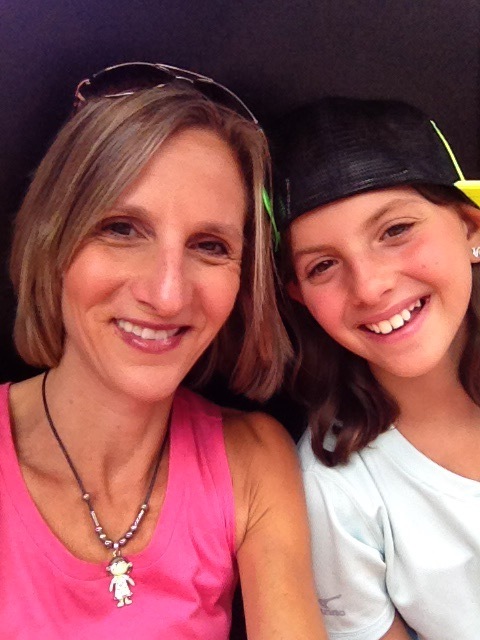 eliseyanoverhttps://eliseyanover.wordpress.comPhysiotherapist, Elite Age Group Triathlete/Runner, Mom, Mizuno Brand Ambassador . Other hobbies: reading, baking, keeping active. 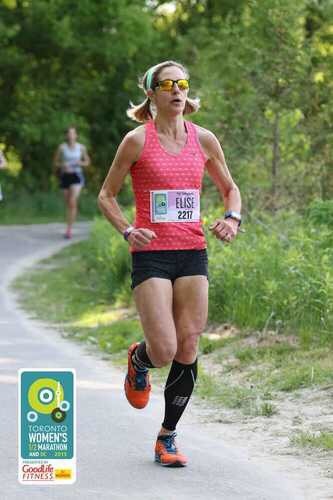 Today I raced in the 5km Canadian Championships as part of the B&O Yorkville run. This race is in its 4th year (I believe) and I have raced it every year except for last year when I had my stress fractures. Last year was the first time it hosted the Canadian Championships. I was so bummed not to be able to participate last year. In 2013, I had my fastest 5km time here in 19:34. Thankfully that qualified me to participate today and compete against some pretty speedy Masters runners! Not to mention all the whipper snapper young ones! Knowing my time was no where near the one in which I raced in 2013, I briefly considered switching to the masses race which went at 9:45. Meghan Brown, the organizer of the 5km Championships convinced me to stick in it as there were some good competitors in the 21-23 mins range. I’m really glad I stuck in it as it was really neat to run in an elite group of people. Only about 100 ran in the Championships race and it was great to be able to pace off of others who are faster with lots of breathing room around you. Here’s how the race went down……. I got there early to get a close parking spot to the finish as I wasn’t sure how the bag check would go and my husband was running down so he needed to easily be able to find the car! 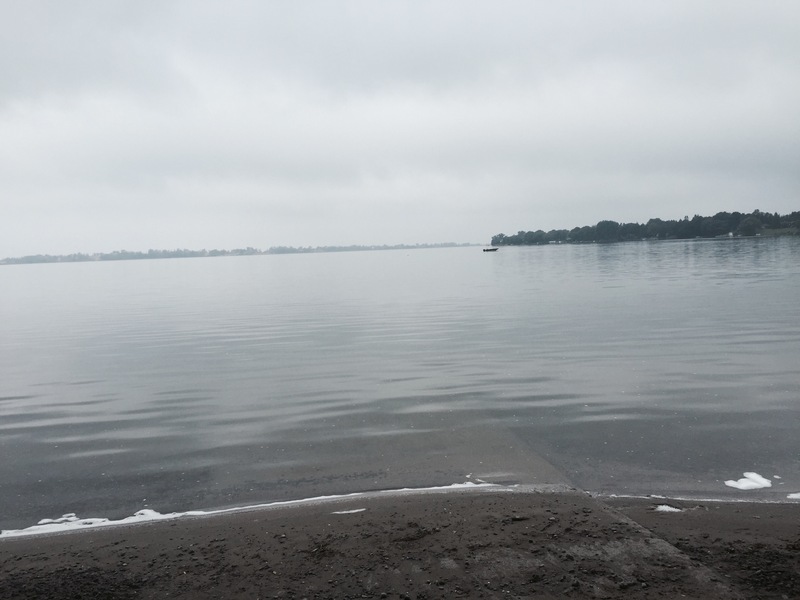 I warmed up with 3km on a windy, cloudy and rainy morning. I wore some warm clothes and by the time I was ready to strip and head to the start I was more than warm. Excellent plan this time as usually I stand at the start too soon and shiver. Today I got there with about 8 mins to gun time. I found my husband and gave him my Breath Thermo top and gloves. (I should have kept the gloves!) I was happy with my choice of clothes so I was not overheated. I felt good on my warm up. Always a good vote of confidence. 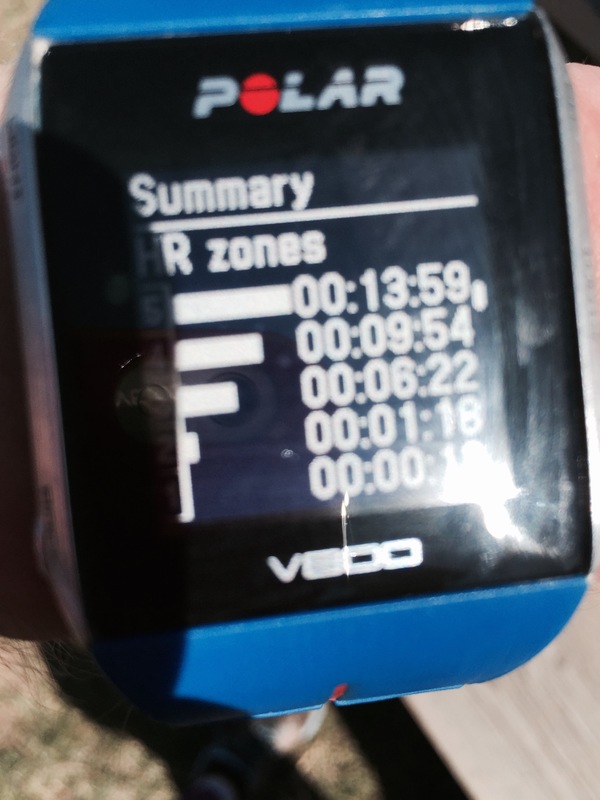 My goal for this race was to go sub 22. I am nowhere near that 20 mins time anymore. Maybe I won’t get there and maybe with another year of training I will. What’s important to me at this moment is I am healthy and uninjured (knock wood)…..! If I never go that fast again I won’t be disappointed. My attitude going into races is so much more relaxed and that feels great. I saw a lot of people I knew running the event and it was nice to catch up and wish everyone good luck. I seeded myself towards the back so as not to be taken down by the sub 20 mins crowd! I felt great for the first 2km. I didn’t look at my watch. I went by feel for the whole race, checking only around 4km at my average pace. 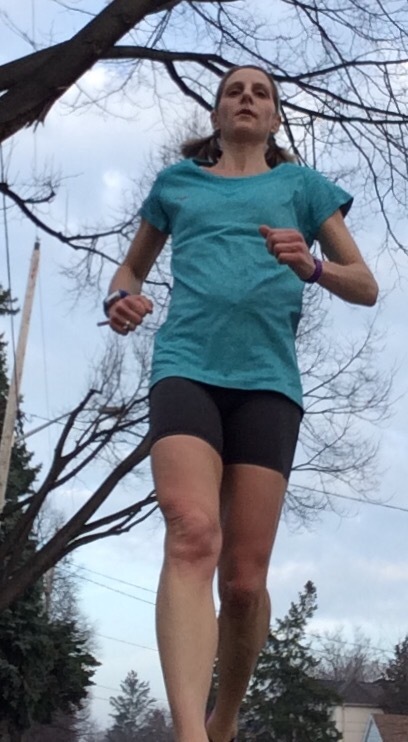 I was running with some of Meghan Brown’s girls who were being paced and coached and I passed them as I heard the coach say to them at 2.5km “conserve here for the hill….. I thought what hill? Oh then I hit Queen’s Park (said hill!, which gets me every time!) The pacer asked me what I was gunning for and I said, no clue but something in the 21’s. She said stick with us we are running 21. Oh and then they dropped me:). Oops guess that first two km I did in 4:02 and 4:05 was too ambitious. I then slowed to 4:24 for the next km….4:30 towards and up the hill, plus the nice 30km/hr headwinds. With about 500 m to go I thought about my track workouts and pushed it. 4:20 for that km. I finished with not much left in my tank but kept good form. The finish photos will tell me if it was! 21:39. Nearly two minutes slower than 2013 but with the same effort! Man as frustrating as that seems I was totally ok with it. I was really happy with how it went. I found out that I was 12 seconds off 3rd in my category. I met up with my husband , collected the great post race food and watched some friends in the main race. The rain stopped and other than the wind it was perfect running weather. I love this event and hope to be invited back next year. Maybe there is a sub 21 in me again and maybe not. Either way I’m happy, healthy and enjoying these short and fast races. I have one more on the schedule on October 24th back at the TO Women’s finale. July has come and gone …! Well it’s certainly been a longtime since I have posted anything. Not that I know many people are reading this :). Summer in Canada just flies by. I swear I could live in a climate like this year round and not miss the other seasons. However my husband would not be interested at this stage in leaving. So as usual I start to look at fall and winter with a slight hint of dread. Don’t get me wrong I love fall but it’s what comes after that makes me sort of dread it! 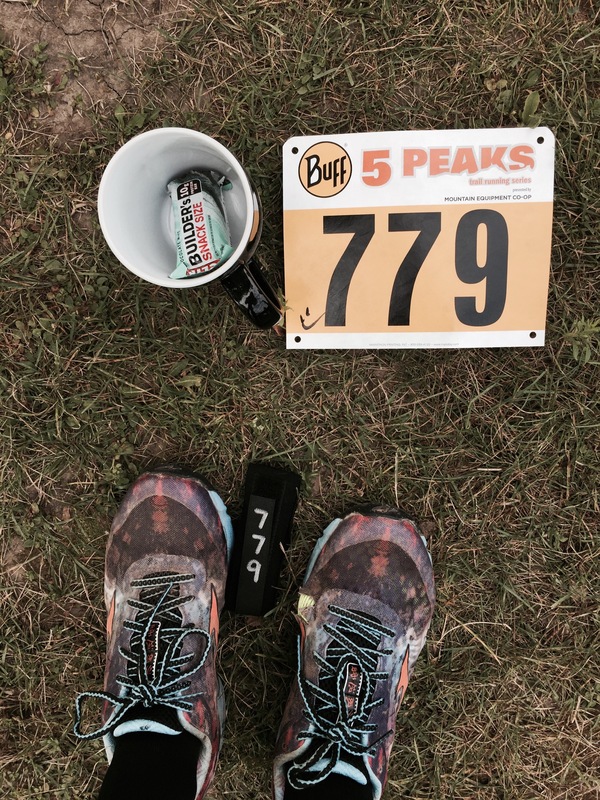 Racing- I did the 5 Peaks Albion Hills race at the end of July. My husband came to do it as well and it was a hot and humid one! But as usual so much fun. Trail races are so great because I never look at my watch. I run by effort and watch the obstacles. This time around I only had one little ankle roll and came away unscathed. Not like last time! I only had to pull my cuboid ankle bone out of its wedge:) I could just feel every off step and angled turn but no issues cropped up. The course was major hilly as usual and with the humidity and heat it made it all the more challenging. I did the sport course which is 6.3 km. I came 5th in my category. This past weekend I decided to jump into a small 5km on the Whitby waterfront. The weather was warm (it is summer after all) but not humid for the 9:30 start. It was a tiny race with just about 50 total in the 5km. Archaic timing and start finish line but sometimes the small races are just nice for a speed workout and good for ego in placing:). I followed this girl for the first 2 km and knew I did not think I could catch her. I was quite happy when she turned off for the 10km route! I was then the first female and stayed that way for the remainder of the race. It was fun to cross as first woman regardless of the small field. My time was 21:36. Slower than the Pride run but hillier too. I’m happy to stay in this range and I know that the 19:34 of my past is bound to stay there and I’m ok with that too. 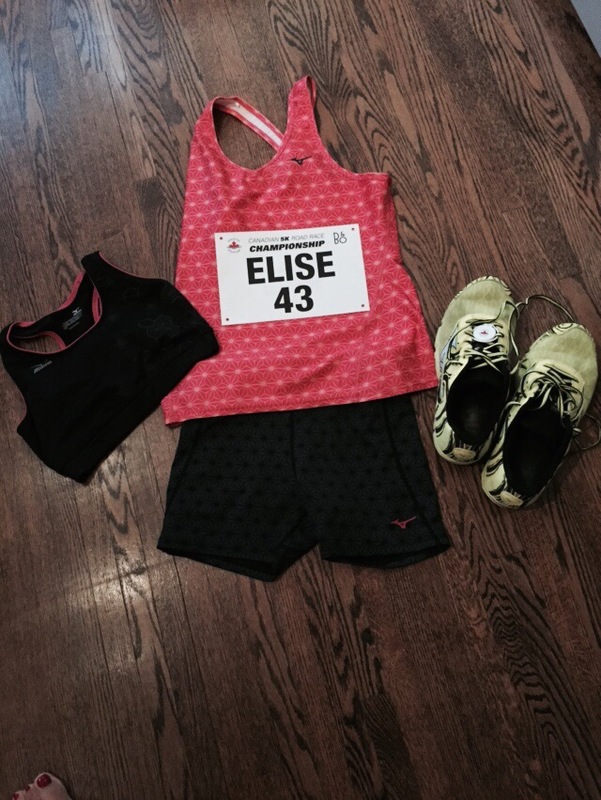 The next race I have is the TO Women’s 5km on August 29th. 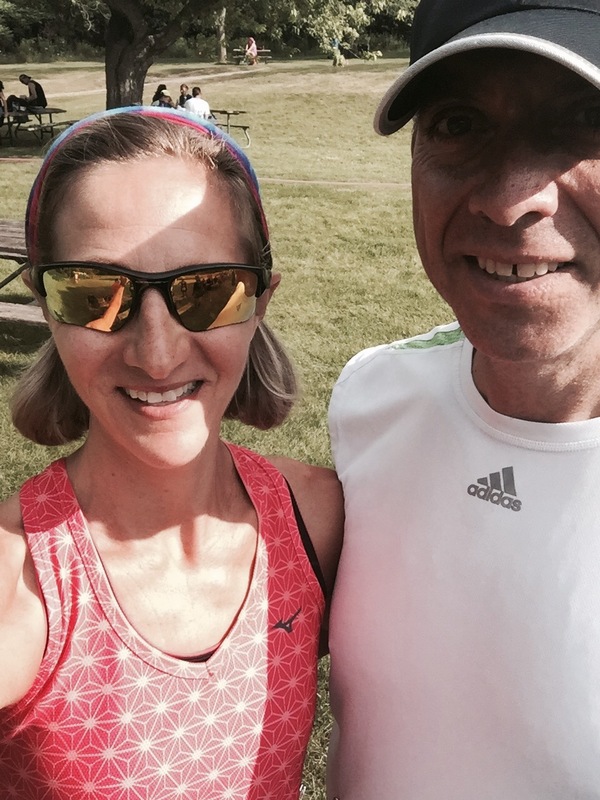 Always fun as a Mizuno event and my friend as the race director. We volunteer as a family and have a great time too. We didn’t travel too much this summer mostly because we have a few large expenditures coming up and needed to hold onto our money! My husband and I went to lovely Prince Edward County for a night. It’s 3 cute towns with kitschy shops and cafes and restaurants plus a beautiful beachfront called Sandbanks. Sadly it rained for our first day but we managed to see two out of the three towns and enjoyed a nice Saturday outside. We tried a bike ride as the town roads are pretty quiet. Unfortunately my husband who had not been on his bike really in 10 years took a spill in the first 5km so we headed back. Next time! 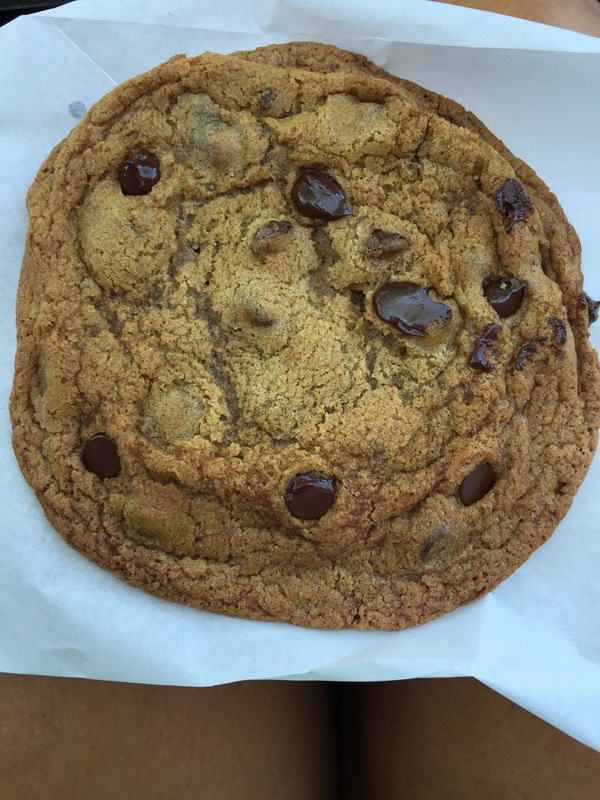 the best chocolate chip cookie from Miss Lilly’s in Picton! We also did a day trip with our daughter to Niagara on the Lake. Another beautiful Ontario town. I’m planning a weekend visit to Montreal before summer is up for my dad’s 75th birthday and to visit my sister and her family who live there. I’ve been riding my hybrid everywhere!! It’s so great to get somewhere in just about the same time as driving would take. But I get to be outside and save money on gas and parking. Unfortunately I had an almost new bike stolen in early July but with gift money was able to replace it. I also got a good lesson on proper use of the Kryptonite lock! I’m still paranoid though. 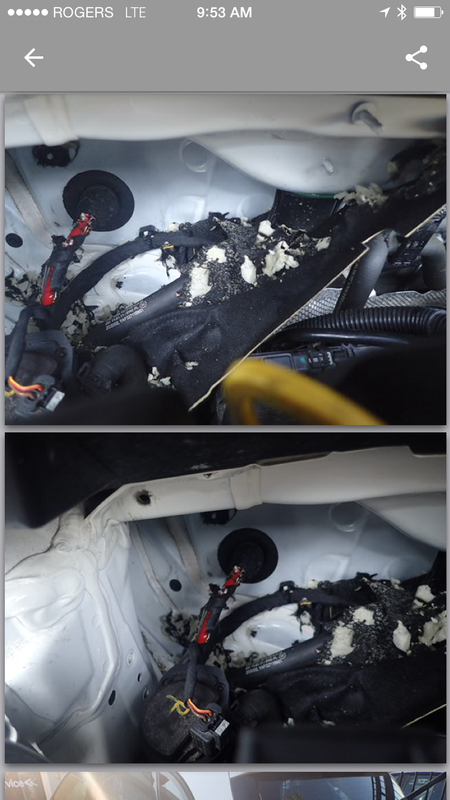 My car insides were eaten by some animal in late July. All the systems of the car were compromised and basically the entire engine and interior need to be rebuilt! Yah 11,000$ worth. Thank goodness for car insurance. Nuts. Thankfully when all the warning lights went on I called the dealership and took it in instead of driving it up north which was where I was headed. It could have been deadly! I’m still waiting for my car but have a rental for now. Finally I’m feeling great! Healthy and happy and after a visit for a physical got great news about improved bone density and balanced blood work. All my hard work at life balance, good nutrition and listening to my body is working. Have an amazing rest of the summer cuz school and fall’s craziness is right around the corner 😩. Lots has been going on here in the last month! It’s all been great stuff but just busy busy with no real down time to just hang out. 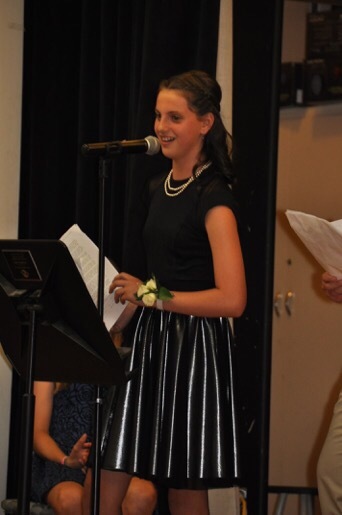 My daughter graduated from Elementary school where she has spent the last 8 yrs. It was hard to say goodbye to a place where so many of your formative time is spent. Not to mention the school is small, with just 305 students. This means everyone knows everyone from students to teachers to helpers. It’s been her place of comfort as well as mine for her. I’ve spent many hours and days on various committees and volunteer gigs that I won’t know what to do with all this “free” time during my regular working day! 😃. I’ve also had great memories of all the staff and parents I have worked with and formed friendships with. June also had a lot of end of year parties for school and extra curriculars plus the odd trampoline meet and family celebrations. So to say by the end of the month I was exhausted is an understatement . Jada left for sleep away camp with a massive cold. Another exhausted member of the family. She’ll be okay though in a few days I hope. This last weekend I raced in the Pride and Remebrance 5km. This race is during Pride Week in Toronto. It’s a race I’ve always wanted to do but always had some triathlon to train for or recover from so it never fit into the plan. 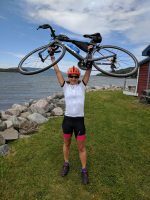 This year there are no such swim/bike/run races so I was free to do it. It was a blast. It’s a low key, no frills race that has one goal of being a time for the LGBTQ community to raise funds and to run as a community as well as anyone else of any gender, race, age and sexual orientation. It basically kicks off Pride weekend. There are no medals, no volunteers pretty much, no mile markers. There was some good food and pastries from Dufflets! I did my 3km warm up and my legs didn’t feel sprightly even though my week of workouts was low because of all the grad festivities in the evenings. Once the gun went off I managed to hold a pretty good pace until the last couple km when you have to loop around again and try to weave through the second wave. Oh and then there was the massive head wind for the final 400m stretch or so. Thankfully the rain held off though. At one point a girl asked me if I was running 4:20’s and I said I have no clue Cuz I’m not looking at my watch. I’m still trying to run by feel. In the end I finished in 21:30 (4:15/km). Again far off my PB but over 2 mins faster than March and 40+ seconds faster than a month ago. The best part was I didn’t feel the same fatigue and weakness set in my left leg that I have in past. The other great thing is my whole mental state before a race is better and calmer. Pre stress fracture I would get really stressed and worried. Now I am in it for the fun and happy to be out there! However I still don’t smile in race photos! One day………. 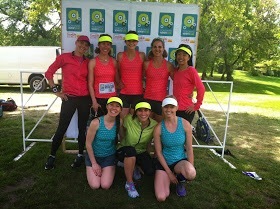 This past Sunday was the 7th Toronto Women’s 5km and Half Marathon in Sunnybrook Park. As I stated in my last post my friend Cory Freedman is the founder and race director of the series. There are 3 races of various distances in May, August and October. 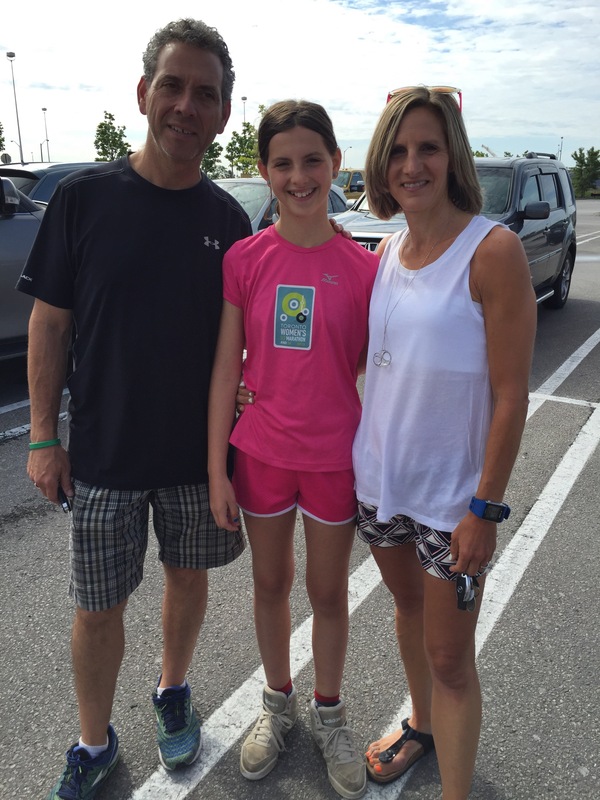 My husband and daughter have also volunteered through the years and my daughter and I have run the 5km’s both together and sometimes separately. This race we decided to run separately. In her words after this last race she said “I run better when I have no one to whine to”. At least the sentiments were shared! As part of the Mizuno Ambassador team, I proudly sported my new spring/summer gear and got to hang out a bit with fellow ambassadors. Because I had two different volunteer gigs for the morning my visits were short! Part of the race environment is support of your fellow women during the race. A great newish tradition is to have Mizuno Run Birds on course. These Birds are Mizuno Ambassadods sprinkled along the course route to cheer, encourage, run alongside and support their fellow runners. I was not an official run bird but did join in after my jobs were completed. What an awesome experience. Running and walking alongside women who needed and appreciated the company and encouragement was so rewarding. One woman in particular was a 61 year old from India. She was in Toronto for 6 months for the birth of her grandchild. When I asked her if this was her first half marathon she said “no it’s my 18th and I’m 61!” We were all so impressed by her. She said she was slow and one of my fellow ambassadors said ” but you are out doing something not everyone would do and you have done more today than most people who may still be in bed!”. How true. The look on this woman’s face when she saw her son and spotted the finish banner was amazing. I had so much fun going back along the last km or so of the course to help others in. I hope to do this again at the coming races! 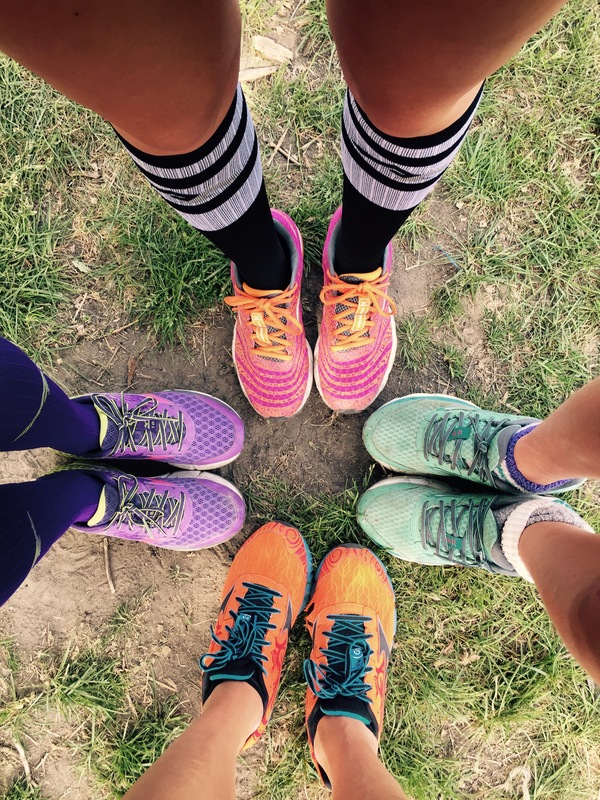 Our rainbow of Mizuno shoes! Now on to my race. This time around as compared to March at ATB I didn’t have any fears of a stress fracture. I still feel like I’m holding back a gear but I definitely worked harder this go around. I started out a bit quick I think as my pace dropped significantly through the last 2 km. My left leg is still considerably weaker than my right and as a result my leg starts to tire and drag a bit. As much as I’m trying to strengthen a few times a week with yoga and gym work I think I need to up this at home too. I tried hard to pick up my pace towards the end but just had nothing left in my legs or lungs maybe? I didn’t once glance at my watch as I wanted to run by feel again. I finished in 22:11, which is almost exactly a minute faster than March so I was pretty pleased at that and pleased that again I was able to race and not hurt myself. I think with each race I will gain that confidence back. It was fun to see my daughter on the out and back and high five each other. I had asked her if she wanted me to double back after and do the rest with her and she said nope. So I waited about 50 m from the finish and watched her sprint in. 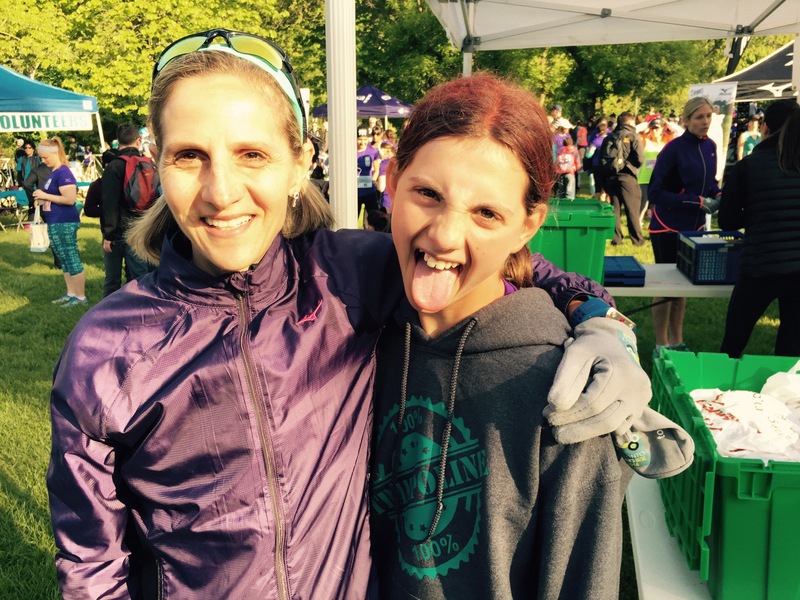 A friend of hers from school and her mom also ran their first TO Women’s run and really enjoyed it. The best thing too about the race is the great Awake chocolate at the end! Oh and the free photo downloads from Zoom Photo! Jada sprinting to the line! I’m really looking forwards to the next TO Women’s Run in August. There is a 10km and a 5km and I’ll race the 5km again then hopefully do some run bird duties! It was very rewarding and a fun way to give back other than my usual volunteer gigs. 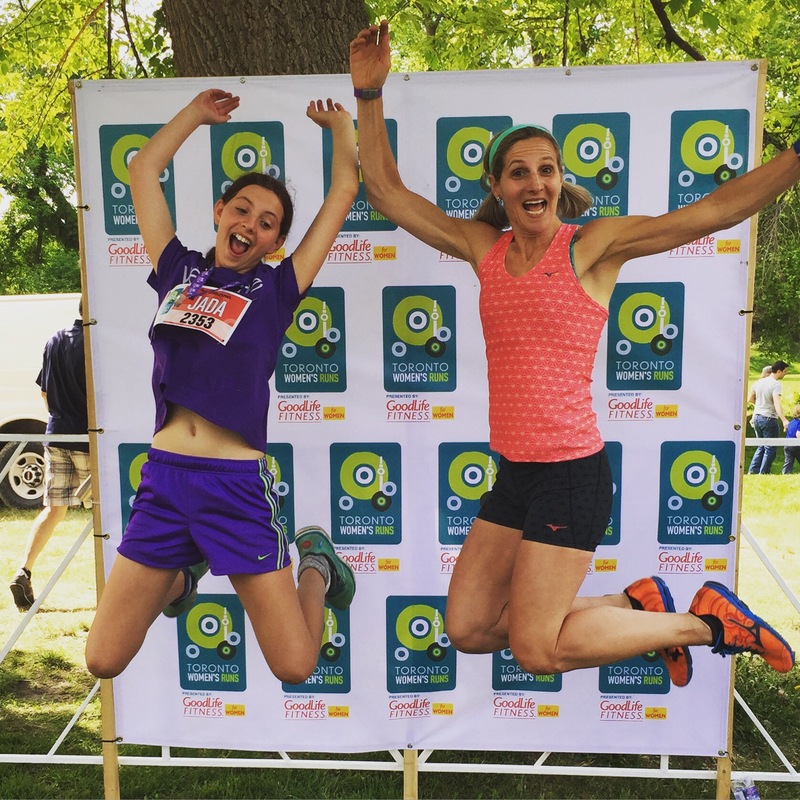 Tomorrow is the Toronto Women’s 5km and half marathon in Sunnybrook Park. 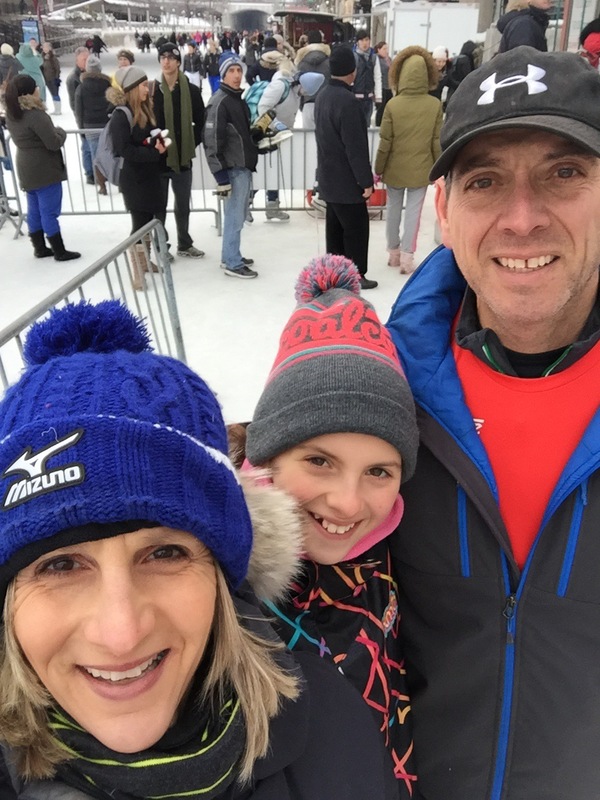 My good friend Cory Freedman is the founder and race director and by very nature of that scenario we have been going as a family to volunteer and run for its 7 year inception. 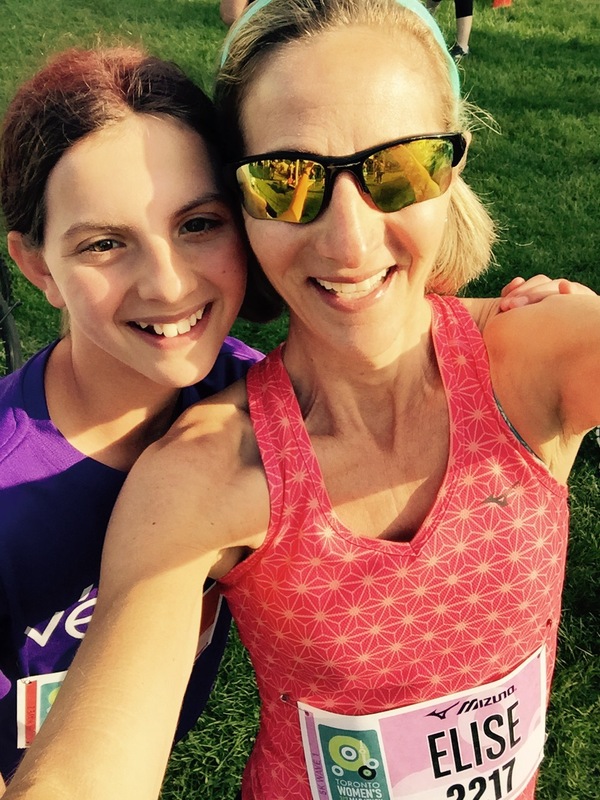 Sometimes I have run with my daughter, now almost 12, and sometimes I have run solo. I have never done the half distance here but always the 5, 8 or 10 as offered at various times of the season. Last year I was on crutches while I volunteered and watched friends and my daughter run the races. This year I again get to run. 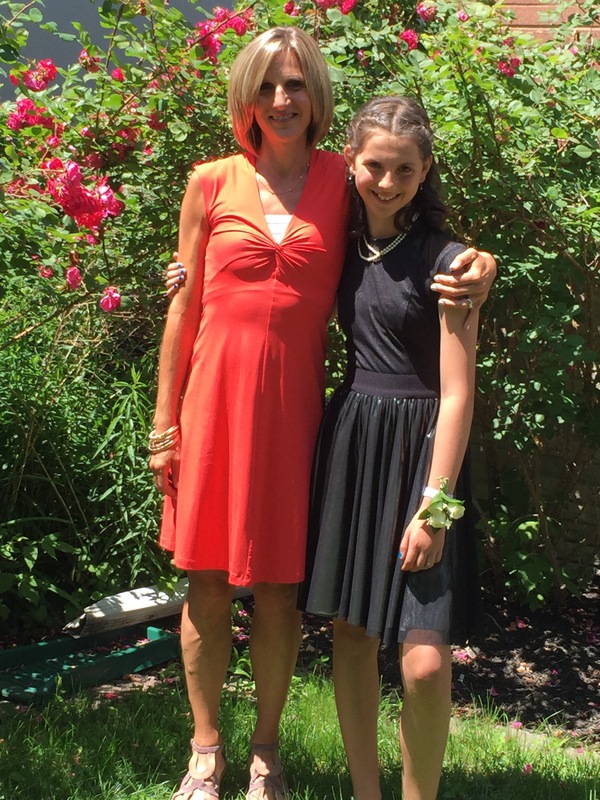 I won’t be running with my daughter (the last time we did one together in the fall we both realized it wasn’t fun for either of us!….. She tends to whine for 4 of the 5 km! We have enjoyed many of these events together in the past but she doesn’t like to practice run (I won’t call it training at her age), so she really does best when she goes solo. I have told her over and over that she doesn’t have to feel like she has to do it but she still claims to enjoy it! Maybe one day we will do it again together but for this one I’ll head back after I’m done and help her make it in! I’m really looking forwards to this race and the best part is I’m feeling a lot more confident in what my body can do than I was at Around the Bay 5km at the end of March. I don’t feel anxious like I did then. I don’t feel like I want to drop out like I did then. I don’t plan to fire on all cylinders this weekend, as I’m still not quite there mentally to push to that extent. I know my body is way stronger, healthier and smart this go around but I’ll leave the all out efforts for later this season, if I choose to go there again. I’m excited for the beatutiful weather that is forecasted and to hang out and run with all my fellow Mizuno Ambassador peeps! And to see my daughter hopefully smiling as she crosses the line proud of herself and having participated in something that not all pre tween girls wake up at 5:30 am to do on a sunny May Sunday! This morning I woke at 4:40 a.m to volunteer at the Sporting Life 10km finish line. A huge spring season opener boasting 27 000 runners. It’s a sure PB with it being mostly net downhill. 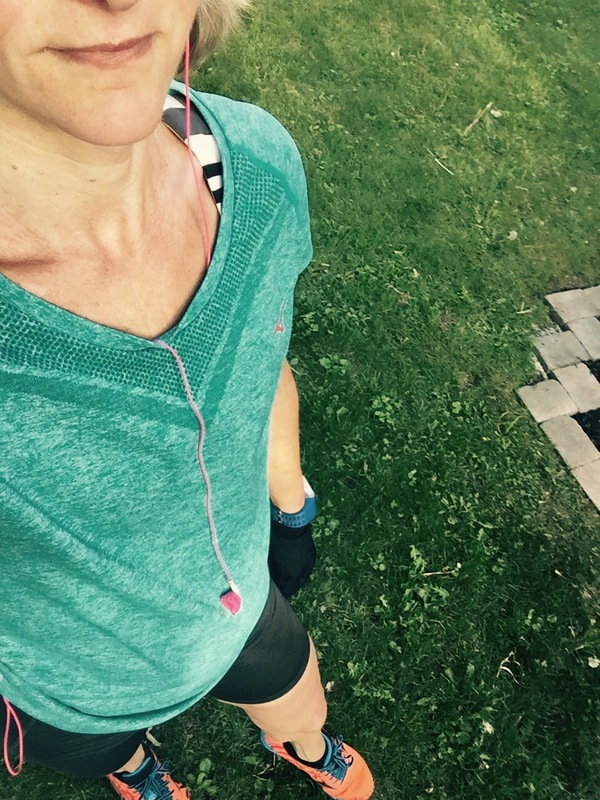 Last year I laced up feeling a bit off in my body and stressed in my mind and body. 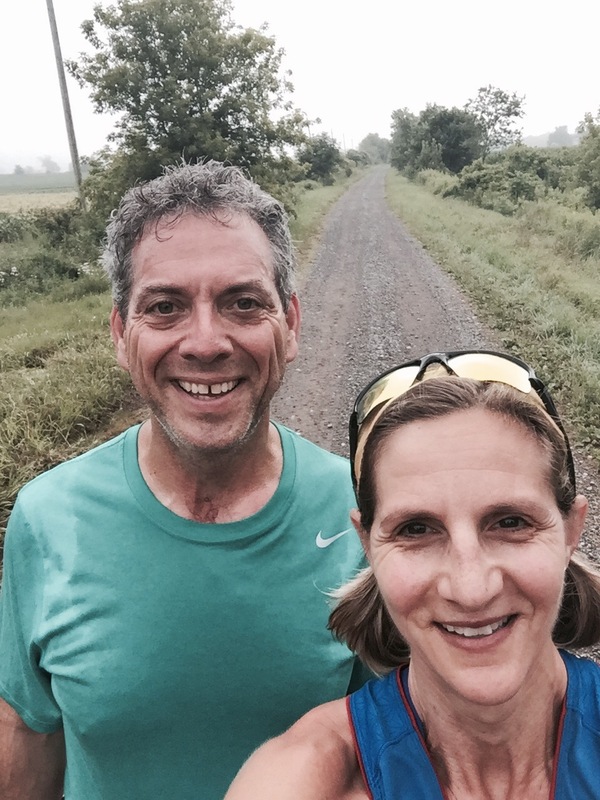 The result was two stress fractures in my hip and pelvis at about 7 km. I finished the race in not so far off my fastest time but….. It was the start of a journey over the past year that I was actually thankful for. The past few years I had worked my body into a fatigued and depleted state. 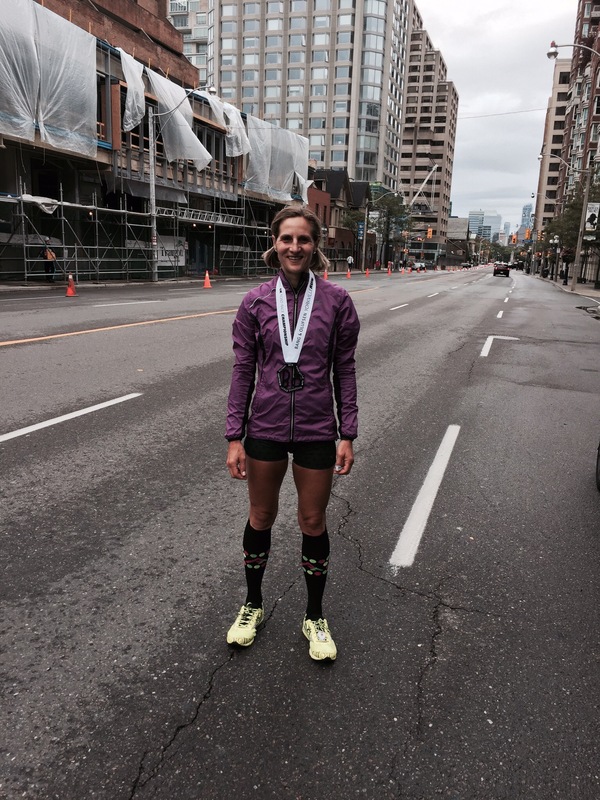 Getting faster, leaner and seeing race results pushed me beyond what my body could handle. The result was last years 10km race. Broken and unable to weightbear I needed to find ways to deal with my new reality. I won’t go into all the details as I did chronicle it in the posts following. However, it taught me a lot. That old adage , everything happens for a reason could not have been more true. Today, this time around I feel healthy, strong, calm in my mind, and focused on what is most important in my life. My husband, daughter and my health. I learned to love myself for who I am, and what I can do. It took a year of my lowest low to get to what I feel is close to my highest high. Sometimes us Type A personalities can be a detriment to our health and well being as much as they are right for our achievements. I am still learning to be nice to me, not expect perfection, and live my life doing what makes me happy and fulfilled. Here’s to a great Mothers Day (even though my daughter is out of town!) and for me a celebration of how far I’ve come over a year. Hi! 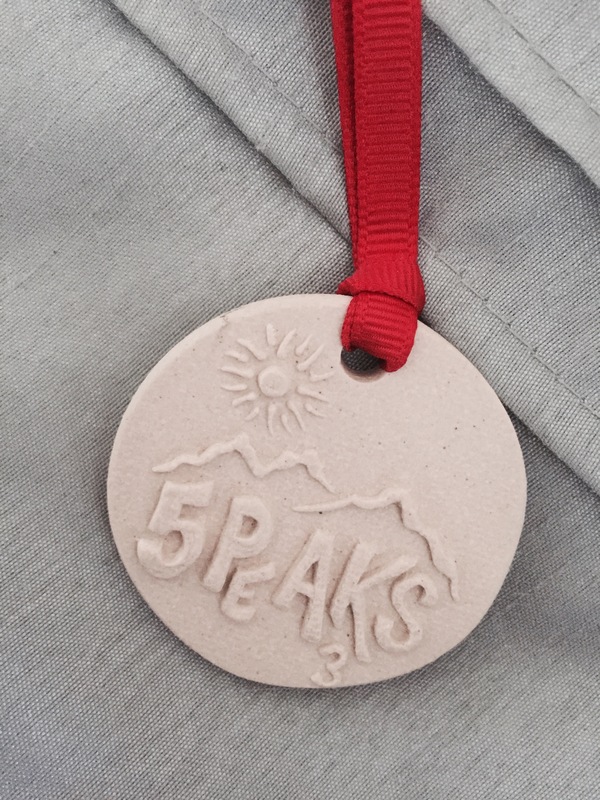 Last weekend I ran my first trail race at the 5 Peaks Terra Cotta trail. This is part of my “try new things” mantra. Since my big injury last year ( almost a year ago exactly!) I wanted to stray from my rigid ways and explore other athletic pursuits. I did a bit of trail running before the winter but nothing like this course! Here’s my recap. I left pretty early as I didn’t know what parking would be like and that always stresses me :). I arrived at about 8:40 for a 10:30 start. I wasn’t the first one there…..but I was early. Now I know. I got a nice close spot so going back and forth to my car to undress, store extra clothes and snacks, and sit in the car to keep warm as the day started out chilly. 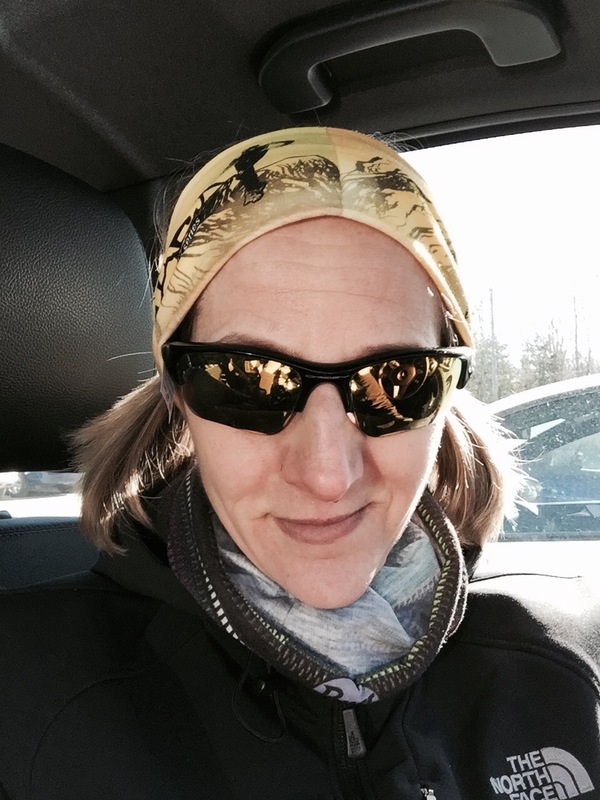 I went to register and picked up an awesome Buff Canada head band. I already have a neck and head warmer thing so I chose the headband option. I then went back to my car to keep warm. With about an hour to go before the race I left the car and met up with a few friends that were also doing the race. Then I headed back to the car and then a short warm up on the first part of the course. They warned of big mud but on my warm up I had dry trail with no real technical sections. I thought hmmm, this will not be as hard as I thought. I stripped down to shorts, t-shirt and arm warmers and of course my gloves as glove weather for me is anything under 13C! My hands get so cold. I seeded myself in the second wave . I had no idea what to expect other than time really doesn’t matter on the trails. I liked that approach. 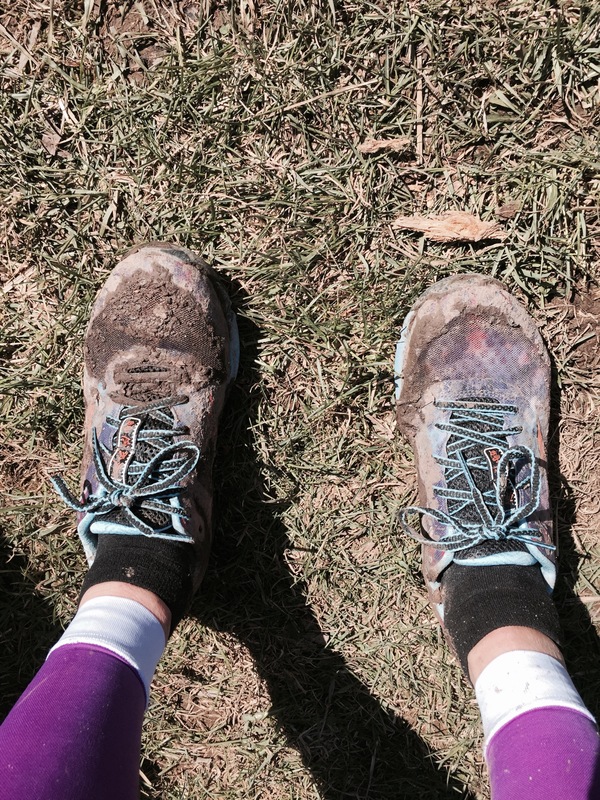 My main goal in this race was not to sprain my ankle. And of course to have fun!! The wave went off and the first 500 m was flat terrain with no major technical footing. A guy running next to me complimented me on my quick cadence and just as I was replying that this is actually a slower cadence than I used to run ( I was told my almost 200 steps per minute could be slowed slightly and still be efficient), and then bam we hit the roots and my ankle rolled ! I felt the pain shoot through it but was okay to keep running and after ten minutes I felt nothing. However It was just so much different than a road run obviously and I didn’t expect every step to require so much concentration! I did slow down a bit more through all the roots and rocks and steep downhills with the log like steps so I wouldn’t further injure anything else by taking a missed step. The uphills were challenging but I surprised myself by passing a few people and felt fairly strong going up. As I ran the technical bits in the first 2-3 km I was so pleased to be doing the sport course and not the two loop Enduro course! My effort was high even though I wasn’t running as quickly as I would on the roads. The best part was not looking at a pace on my watch and just focusing on making the footing . They had warned of big muddy patches ….. They were not wrong! On the first one I tried to piddle through and then gave that up and just soldiered through trying hard to hold onto my shoes! my heart rate was in a high zone! The final km was not as technical and I did glance down once at my watch and saw I was running 4:15/km so I was surprised sort of to still be able to hold effort after the work I did on the trail. I managed to come 3rd in my category having first and second all within a minute of me. I stayed for the awards and some of the draw prizing which is probably one of the best of any races I have done. Cuz really it’s all about the swag! Oh and the finish line food had both peanut butter and almond butter….heaven! After the race was worried about my ankle but knew it wasn’t too bad as I could trot to my car and back and walk around as if it was normal. It didn’t swell or get colourful . Me being the physio, I grabbed ice right away and then used arnica cream and tablets and ultra sounded and kept icing and KT taped it. The end result was a run two days later with zero pain. It’s been fine all week. Phew! I’ve rolled this ankle many times on flat ground and never that badly but this time it hurt when I did it. Having spent last spring and summer on the shelf with my stress fractures , the last thing I want is another lay off. I want to enjoy nice weather activity after another brutal winter. Hopefully I will be able to fit in another 5 Peaks in July at Albion Hills. The others don’t fit with my free weekends . It was a fun start to the spring after ATB. 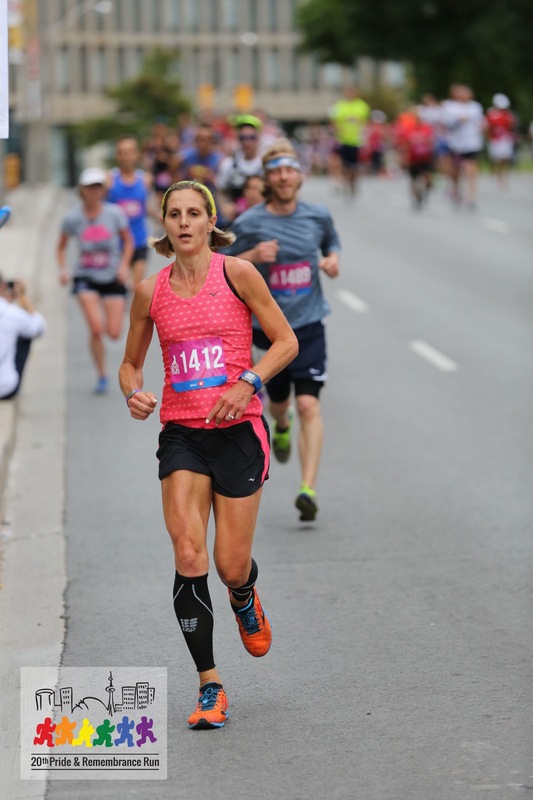 Next up is the Toronto Womens 5km on May 24th. I’m feeling confident that I can push it slightly harder than ATB but I think I’ll save one more gear still. I have less fear but it’s not totally gone. I’m looking forwards to this race as last year I was on crutches and really wanted to represent Mizuno in my first year as an ambassador. So this year if all goes well I’ll be able to do just that. 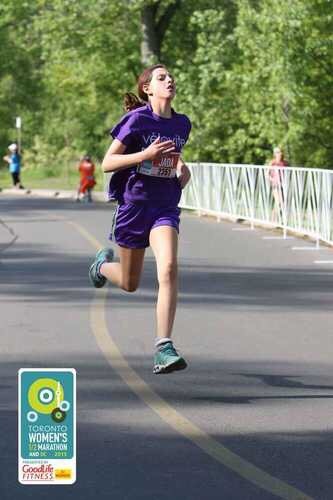 My daughter will also run the 5km but not with me. After the last one in October I told her it wasn’t fun hearing her whine the whole time 🙂 and the one time she ran solo she did her best and had the most fun! So I do think it’s mutual!! !